Game description: Create your own team, and control every wacky pitch, clutch hit, and sprint for home. 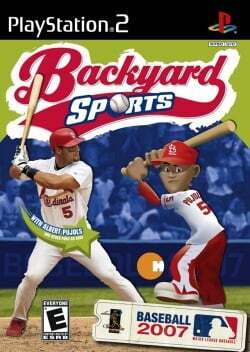 With players like Alex "A-Rod" Rodriguez, secret pros to unlock and amazing power-ups, kids can play big-league ball right in their own backyard. An all-star MLB lineup: Carlos Delgado, Alfonso Soriano, Nomar Garciaparra, Alex Rodriguez, Ichiro, Albert Pujols, Eric Gagne, Pedro Martinez, Ivan Rodriguez and Vladamir Guerrero. This page was last edited on 5 December 2015, at 09:35.